I suppose it’s not too surprising that the 2016 LEGO® lineup for Rogue One only includes one Rebel set (versus four Imperial sets): it’s the story of a plucky band of insurgents against a galactic Empire, after all. Initial photos of the set including the box art left me cold; I found it unattractive and boxy and wasn’t sure it was an acceptable value, especially at $79.99(US) for 659 pieces. Out of the box, though, this set really surprised me; built, it’s bigger than I expected and has great detailing. Part of the set’s higher price tag is certainly the minifig count; usually a set this size would not include 5. The U-Wing is the only source for a Jyn Erso minifig in 2016 and also comes with Cassian Andor, Bistan, and generic trooper and pilot minifigs. Bistan’s head and Erso’s and the trooper’s helmets are all new molds; Erso also has a new cloth cape. Torsos are printed front and back. 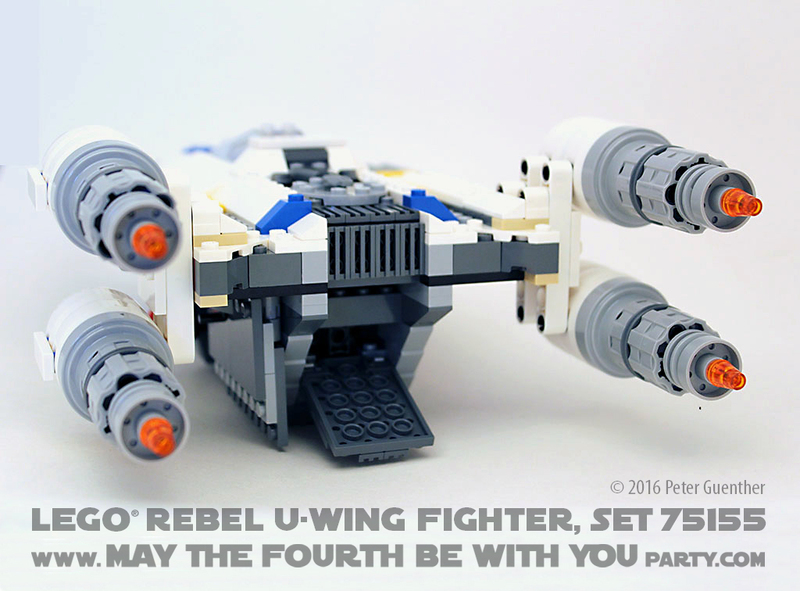 “Fighter” is a misnomer for this ship, as it seems to be more of a troop carrier. It’s hard to tell in the trailers how many shots are inside its belly, but it definitely has room for multiple rebels. The LEGO® set includes doors that swing open on both sides and a ramp that drops down in back; while the doors give access to seats and mounted guns, the rear ramp doesn’t really give access to anything. 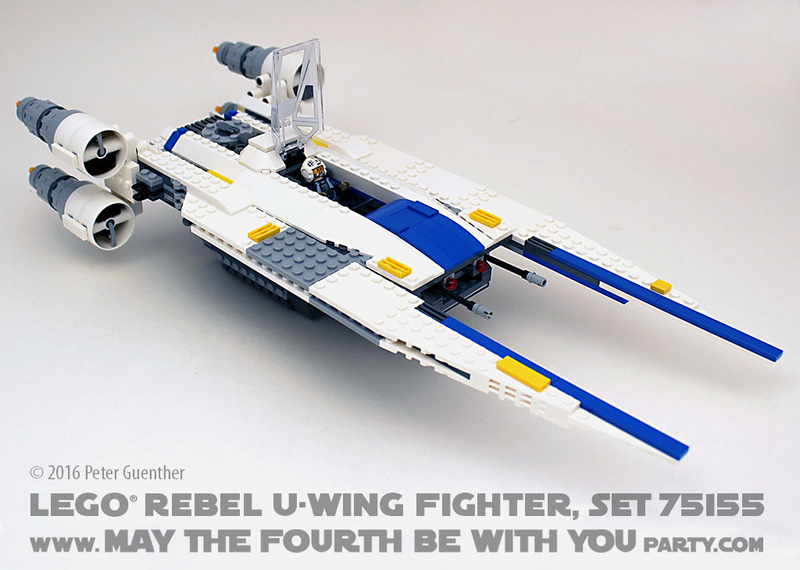 Unlike the movie ship, the LEGO® set only fits one pilot, rather than two side-by-side. Aside from that, the set’s styling seems accurate. I’m a little puzzled by the lack of an astromech droid–what is this, Star Trek?–but perhaps the movie will reveal a reason why. 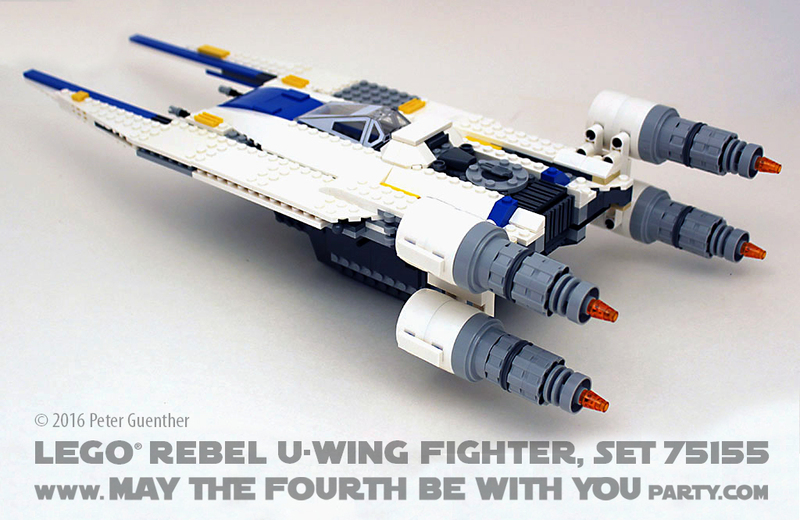 The U-Wing sports a swing-wing design with an impressive wingspan when the wings are swept back. (It doesn’t look much like a U in either configuration, but hey, Y was already taken.) Other play features include the mandatory spring-loaded bolt launchers as well as minifig pistol-sized stud launchers behind the side doors. Playability: With all the play features noted above and an opening cockpit, this ship has a lot of possibility. It stays together well and is eminently swooshable, especially with the wings back. The lack of any Imperial minifigs in the set mean that you’ll have to look elsewhere for targets. Challenge: The set is listed as 8-14; build techniques go beyond the basics but aren’t terribly tricky. 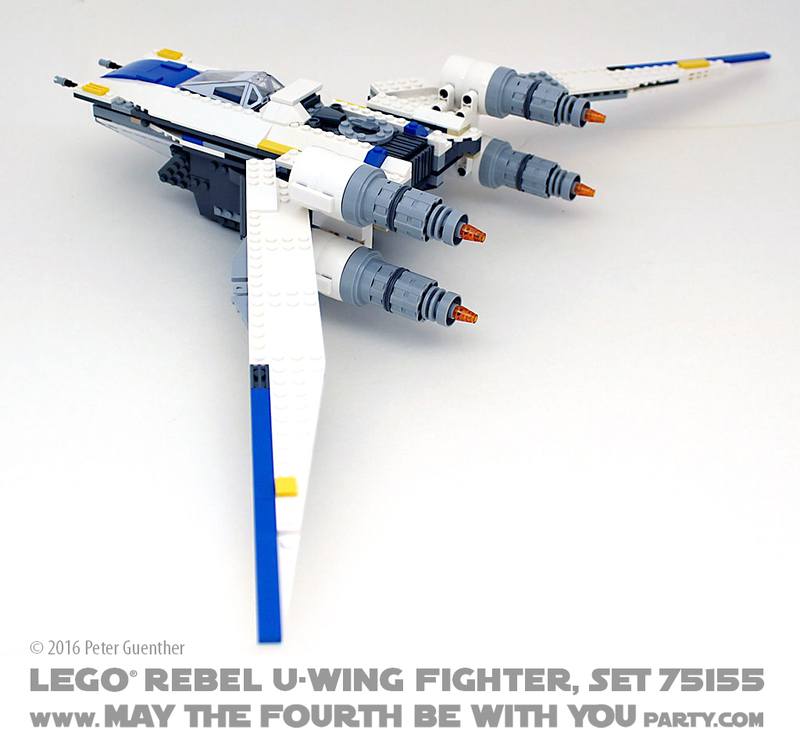 The set is not built symmetrically; there are differences in the wing panels between sides, providing a little variety but slowing down builders who build mirror images at the same time. Accuracy: The U-Wing appears in a number of angles in the trailer; overall this set seems to be an accurate depiction, but it uses “selective compression” in areas like the single-seat cockpit. Value: At more than 12 cents a piece, this set is a harder sell; however, with five minifigs and given the size of the completed build, it ends up a satisfying value. Check out all the LEGO Star Wars Rogue One Sets, click here. 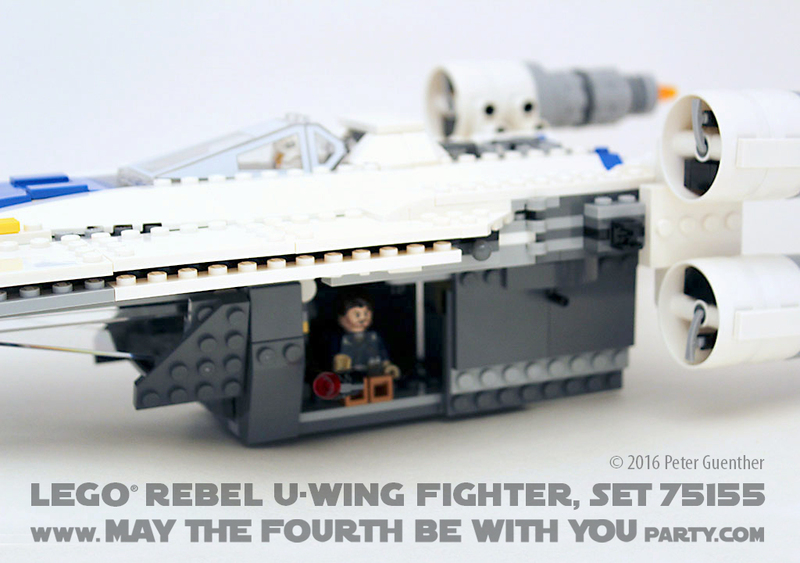 Or if you want other Star Wars Lego sets and mini figs, you can find them here.